Description: Vodovod - connect the pipes game. 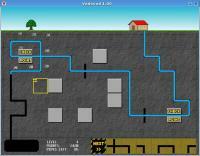 Vodovod 1.1 (Waterworks) is a simple SDL game by Milan Babuskov. Try to connect the pipes and keep ahead of the water flow.